Maui is an armchair in scented cedar. 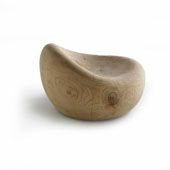 It consists of a single, hand-sanded piece of wood with a diameter of over 75 cm. It is also available in Kauri wood. An ideal accent for both indoor and outdoor furnishing (as long as it is not directly exposed to water, sun or frost). Available in versions with a fixed or swivel iron base.